In some WordPress Blogs the in the sidebar the category listing are long and take up lot of sibebar space.Here’s a trick that can be used to span the category listing into 2 columns saving more sidebar space. 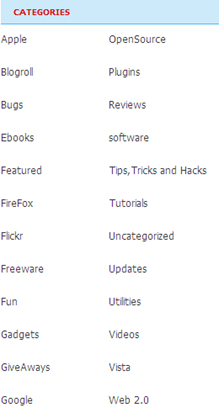 – All Categories and child Categories (Default). 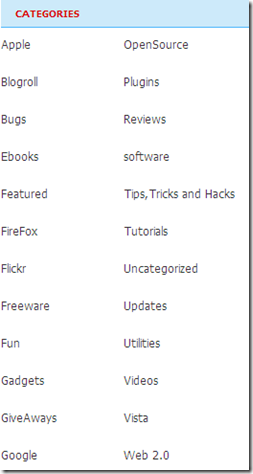 1 – All Categories displayed in flat (no indent) form (overrides hierarchical). Thanx for the code. I will try out this code and see whether it works or not. Are you using the same code? @Ricky : Yes Ricky I’am using the same code.